McLaren's Lewis Hamilton says he does not know which team he will be driving for next season. BBC F1 chief analyst Eddie Jordan reported on Wednesday that Hamilton, whose McLaren contract runs out this year, had agreed terms with Mercedes. 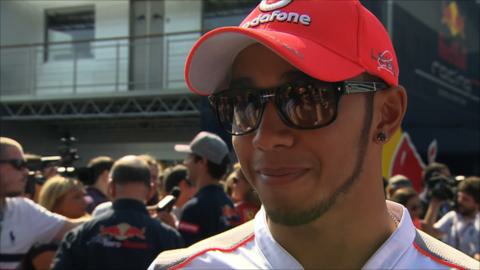 But when asked if he knew which team he would be with for 2013, Hamilton, the 2008 world champion, said: "No." The 27-year-old Briton added: "I want to win. Just need to think of the right place to do so." But he echoed his management's statement on Wednesday that he was "in advanced negotiations with McLaren", adding: "That's what we're working on." Hamilton, who drives alongside fellow Briton Jenson Button at McLaren, said he did not have a deadline for a decision and insisted he was focused on the remaining eight races of the current campaign. "I'm in a great position and I just need to focus on the preparations for these races," he said. "There is a long way to go. Jenson has shown we have great potential in our car and team. That's what I need to focus on." Hamilton has had a mixed season so far. He won in Canada and Hungary but lies fifth in the standings, 47 points adrift of leader Fernando Alonso in his Ferrari. Michael has a huge amount to offer. I'm very happy with his performance. But Button believes his countryman will remain with McLaren. "I think I'll have the same team-mate next year because this is the best place for him," said Button, speaking ahead of this weekend's Italian Grand Prix at Monza. "If you're in the same place for too long, it can get a bit stale, but not here. This is a great team and a team that's always giving us a chance to fight for wins. "Whether we've had the chance to fight for the championship, that's another question, but they always give you the possibility of winning grands prix and that's what a driver wants. "I don't think anything will change next year in terms of driver line-ups, but I might be wrong." Speculation about Hamilton's future has gathered pace in recent days. The Englishman, who has spent his entire F1 career with McLaren, found himself in trouble during at last weekend's Belgian Grand Prix for tweeting sensitive technical information about the McLaren cars. Then BBC F1 analyst Eddie Jordan said he was poised to join Mercedes after F1 boss Bernie Ecclestone hinted to Jordan that seven-time champion Michael Schumacher was to retire and leave the team. Mercedes team boss Ross Brawn said a decision on his team's driver line-up was "still some way off". "Lewis is a very good driver, an excellent driver," said Brawn. "We want to be a team that every driver wants to drive for." But he added: "Michael has a huge amount to offer. I'm very happy with his performance. We have to find a solution together." Schumacher, who came out of retirement in 2010, said he had yet to make a decision about his future but added that he was aware of the claims made by Jordan. "There is no comment. Eddie can have his point of view," said the 43-year-old German, who insisted he was sticking to his original assertion that it would be October before Mercedes would make any sort of comment regarding his future. "I may regret giving that date, but I guess by then we'll have something to tell you." First practice 08:55 BST, BBC Sport website live text and audio commentary. Second practice 12:55, BBC Sport website live text and audio commentary. Third practice 09:55 BST, BBC Sport website live text and audio commentary. Qualifying 13:00, BBC Sport website live text commentary and BBC Radio 5 live. Qualifying highlights: 17:30-18:45, BBC One. Race: 13:00 BST, BBC Sport website live text commentary and BBC Radio 5 live. Highlights 17:30-19:00, BBC One. Race highlights repeat: 0030-0200, BBC Two.